From a Chef, the MMMM…. of culinary sayings is the difference between prawn and shrimp. Yes, they are all classified as shrimp but prawn was brought to you as a marketing tool. I love the naming difference because it truly gives me an idea of how to buy the right stuff. The word shrimp conjures up a memory when I was a youth soccer player and I decided to call myself shrimpee. In these years I was a fierce competitor and not very tall(shortest on the team.) I knew with this nickname, everyone would underestimate shrimpee until we won the game because shrimpee scored goals on them! Perhaps this early name secured my fate for cooking. This month we are celebrating some amazing prawn dishes at all three Salty’s locations and my very favorite, Garlic Chili Prawns. I want to take this opportunity to offer some guidance on shopping for really good prawns and shrimp. Although Kathy cannot eat these tasty morsels I am sure she knows about their nutritional value in her latest blog (The Crustaphile Smile). Know your size: Prawns come in a range of sizes and all of these are graded on an average number per pound. Prawn cocktail sizes are usually 21/25 meaning 21 to 25 per pound where bay shrimp can be 175-225 per pound. This will let you know the size you want for the right application. Know Your Type: There are many types of prawns out in the world. The most common are tiger prawns that are grown outside the United States. These prawns have a nice pop and chew to them and are very clean in flavor. Blue prawns and gulf prawns are also common. These prawns are great for grilling but can sometimes be mushy when poaching. Precooked? Frozen? Fresh? Unless you are on the beach it will be hard to get a fresh prawn. 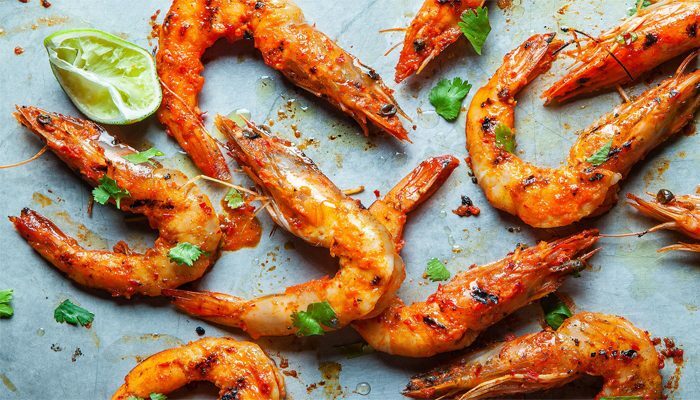 Prawns are such a staple in many diets because they grow extremely fast and they also freeze well. Any thing classified as a prawn I recommend buying raw and shell on. The shell protects the skin. Bay shrimp are always going to be precooked since they cook them right when the boat comes in from the catch. May through August you can get fresh Oregon bay shrimp so keep an eye out for them. These shrimp are so sweet when fresh!!! Fresh or frozen is a crazy game when it comes to seafood. There is a new word out there to confuse us all, REFRESH. This is on a lot of products and means that it was frozen but then thawed with love. Whenever you are buying seafood BE AWARE of this deceiving word when you are looking for a fresh product. Another key word(acronym) in the prawn business is I.Q.F. This means Individual Quality Frozen. The prawns are frozen individually for quick freezing and easy thawing. After you’ve found the perfect shrimp/prawn, give me a call, my old soccer pals and I will help you eat them!